A fixed rate mortgage is the product of choice for about 95% of today’s mortgage shoppers, according to lending software company Ellie Mae. 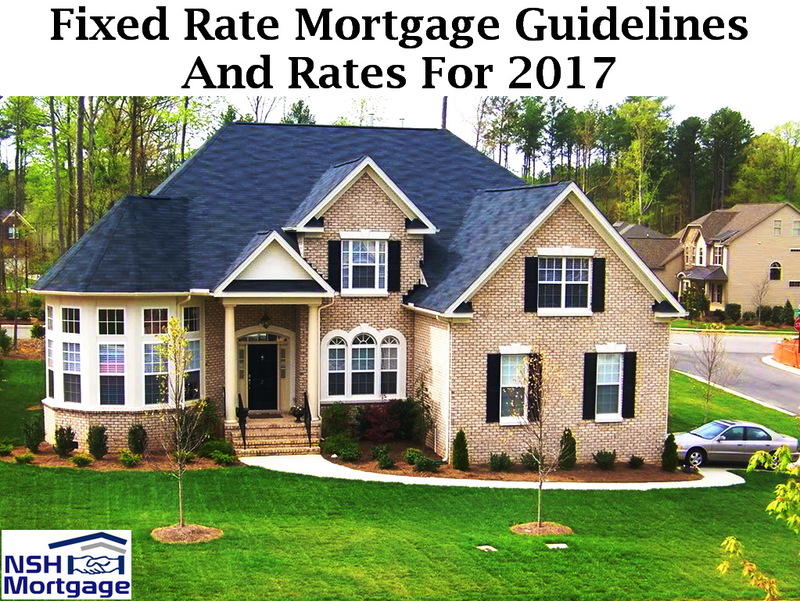 Here are the fixed rate mortgage guidelines and rates for 2017. NSH Mortgage has the knowledge and tools to help you with the new fixed rate mortgage guidelines and its rates. Its popularity is no surprise. Homeowners can lock in a low interest rate, around the low 4% range at the current rates for up to 30 years. An unchanging rate for that long was not even an option a few generations ago, and it still is not for most home buyers living outside of the United States. The stability of a fixed rate home loan lets buyers purchase with confidence, knowing that their payment will not change. Budgeting becomes very easy. A fixed rate is not the best choice for every homeowner, but for many, it is the only choice. But even within the realm of fixed rates, there are several choices. Knowing all the options will put you in a better position to choose a certain type and get your best mortgage rate, too. How Does A Fixed Rate Loan Work? With a fixed rate loan is one whose interest rate never changes. That means the principal and interest payment never changes, either. Each month, the homeowner pays decreasing amounts of interest and increasing amounts of principal while the payment stays constant. This process is called “amortization.” Amortization simply means you are paying off some of the balance each month until the loan is completely paid off. When your loan starts out, you pay mostly interest. Toward the end of your loan, most of your payments go toward principal. This is because interest is due only on what is owed. So, by the end, you owe next to nothing in interest. Not only are the interest payments lower, they start decreasing more rapidly toward the end of the loan as principal vanishes faster. But, as a homeowner, you do not necessarily know how much principal and interest you are paying each month, and you do not have to. The important part is the unaltered full payment that you can count on, thanks to your fixed rate. The most popular form of fixed interest home financing is the 30 year fixed mortgage. This option spreads out the principal repayment over a long period of time, making even very expensive homes affordable on a monthly basis. Other fixed rate options are available in the marketplace, including the popular 15 year fixed rate. Additional short term options include the 20 year, 10 year, and even 5 year fixed. Some lenders even offer any loan term you would like, such as a 13 year mortgage. No matter what loan term (meaning length of the loan) you choose, they work the same. The longer the term, the lower the monthly payment will be. Here are popular options side by side for a $250,000 loan. The 30 year fixed is very affordable (you buy a quarter-million dollar item for about $1,200 per month). But it is not the “perfect” loan, because the longer you stretch out the payment, the more interest you pay over the life of the loan. And, you can typically get lower rates for short term loans. For instance, Freddie Mac reports that most lenders typically offer a 15 year fixed loans at a 75 basis-point (0.75%) discount compared to 30 year rates. That means a four percent rate is closer to 3.25% and perhaps even lower for a 10 year product. That is why many homeowners and even new home buyers choose a shorter term for their fixed mortgage. Not only do fixed rate loans come in different loan lengths, they also come from various agencies. Fannie Mae and Freddie Mac, for instance, offer conforming loans (often known as conventional.) The Department of Veterans Affairs promotes its VA loan program, by which home buyers with military experience can get a zero down mortgage at very low rates. Veterans also have access to the VA streamline refinance program, also called the IRRRL. This refinance allows a homeowner to lower his or her rate without income documentation or bank statements. FHA fixed rate loans are very popular of late, as home buyers enter the market without a big down payment available. This program requires just 3.5% down, and credit standards are lenient. Best of all, FHA rates are very low. Conventional, VA, FHA, and USDA lending offer adjustable rate mortgages (ARMs). USDA home loan sets itself apart by offering only 30 year and 15 year fixed loans. USDA is meant to promote home-ownership to those who could not afford a home otherwise. In line with that mission, it offers the most stable and affordable products of all. In the table below, you will see a sampling of currently available home loan rates. Note the difference between conventional and VA. It is important to explore all your fixed rate options when buying or refinancing a home. Is A Fixed Rate Mortgage Right For You? Just because a fixed rate is the most popular option does not mean it is the right loan for your situation. Homeowners who plan to sell or pay off their mortgages, in five to ten years, might consider an adjustable rate mortgage, or ARM. A ARM loan is fixed for a certain period of time, then starts adjusting based on the current market. For instance, a 5 year ARM stays at a very low rate for five years, then it can go up or down. Fixed period options are many: typically they are three, five, seven, or even ten years period points. The initial fixed period for ARMs is very low. The homeowner that chooses a conventional ARM loan could cut their rate by upwards of 0.75% or more. That could save the homeowner $9,000 in interest over five years. The average mortgage is around seven years old when it is either refinanced or the home is sold. So, for a buyer or refinancing homeowner that does not plan to keep the mortgage long, a ARM could be better than a fixed rate.